The origins of modernism go back to the early attacks on Genesis 1-11, and on the Mosaic law. These were seen as evidence of primitive myths and primitive law. 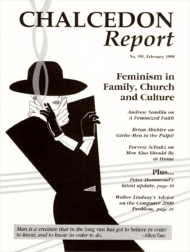 Feminism is essentially a false religion warring against historical Christianity. By a feminized faith, however, I refer not merely to the organized goddess religion of allegedly Protestant churches: this expression of feminist religion is obvious. Feminism is a radical movement. As such, it goes to the very root of the relationship between men and women and seeks to alter the societal and institutional structures that are perceived to be in conflict with the ideas and goals of feminism. Okay, so Columbus was slightly off. We can fix that by calling the area where he landed the West Indies. But East or West, Indians are now coming to New York City, and thanks to you, we are here to greet them in the Name of Christ, Lord of all nations. Those zany girls of NOW: Betty Friedan, Patricia Ireland, Eleanor Smeal, Schlamzao, Pots and Bets Incorporated. They are always good for a belly-holding, tear-wiping guffaw. Today's typical Christian critique of feminism with respect to the family rightly insists that the mother belongs in the home but it fails to insist that the father also belongs in the home doing his work there with his wife as his helper. he so-called "year-2000" software bugs provide an extraordinary opportunity for Christian Reconstruction. Few problems are both clearly visible ahead of time and inexorably threaten the lifestyles of a billion people. Two Frontline Fellowship mission teams have succeeded in delivering and distributing the largest shipments of Bibles and Christian books ever smuggled into an officially Islamic country. Another month, another foreign enemy. No sooner had Washington's war party completed its hysterical attempt to demonize China — calling its burgeoning prosperity a threat to world peace — than it featured another country in the bulletin of the War-of-the-Month club. St. Anselm is one of the great but neglected men in the history of philosophy. Anselm (1033-1109), born of a noble family in Aosta, Lombardy, made his mark in the culture of monasteries, and he later became Archbishop of Canterbury. Over the centuries, and by no means any less in our time, errors and heresies have occurred in the church.